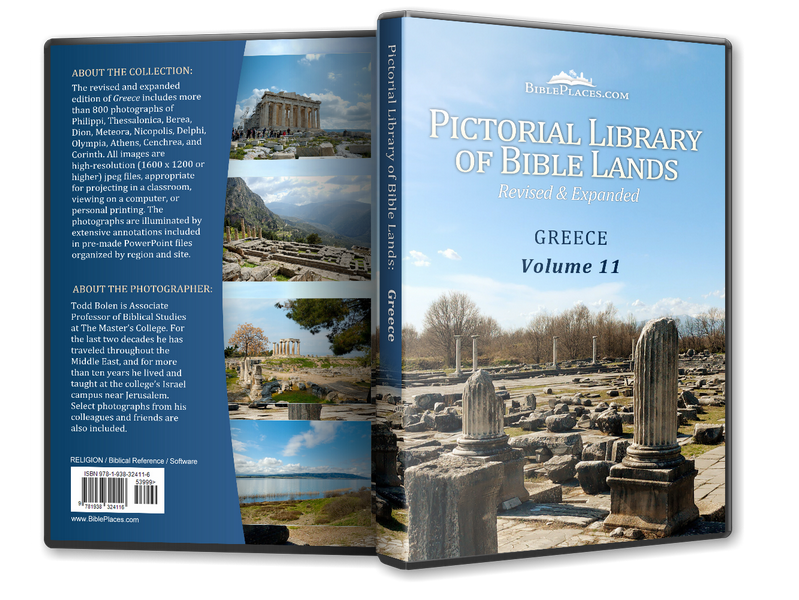 For related photographs, see our Corinth page. The Corinth area here is visible from the Acrocorinth above. The remains of the ancient city are located in the center of the photo (in the midst of a modern village), the ancient harbor is roughly in the center of the visible shoreline, and the isthmus is out of view to the right. One of the great crossroads of the ancient world because of its location on the isthmus linking the Peloponnese to mainland Greece, Corinth was a thriving Roman colony from the time of Julius Caesar. The city is always described as “wealthy” in the ancient sources and this prosperity was due in part to the city’s taxation of the north-south and east-west trade routes. 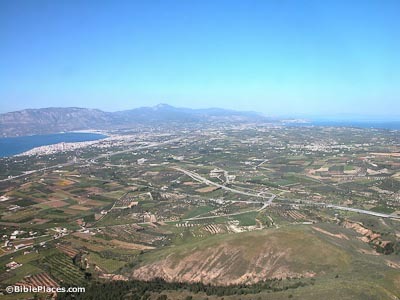 This is a view to the north from the Acrocorinth. The ancient city of Corinth is just out of view to the bottom left side. 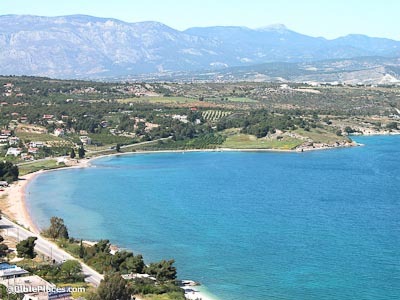 The isthmus connecting the Peloponnese and mainland Greece is four miles wide and as early as the 6th century BC, work was begun to dig a canal connecting the Corinthian and Saronic gulfs. This project failed but a paved road (the diolkos) was constructed about 600 BC to allow light ships to be hauled overland. The modern canal was completed in the late 19th century. 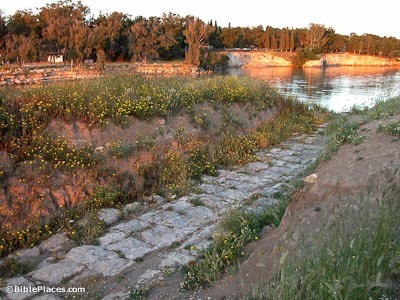 Instead of a canal, the ancients constructed a road across the isthmus to connect the two gulfs. This road, konwn as the “Diolkos” was built in about 600 BC, and allowed light ships to be hauled overland. Portions of this road are visible on the western side of the isthmus. 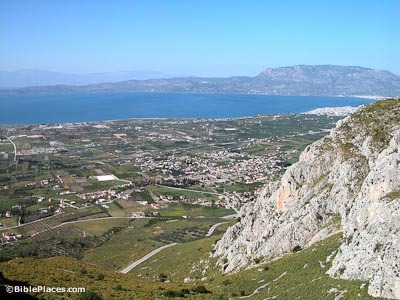 Ancient Corinth had two harbors on the Gulf of Corinth. The northern port was known as Lechaion and is today silted up and a few hundred meters from the modern shoreline. Cenchrea was the port for Corinth on the eastern side of the isthmus, and remains of the ancient harbor are visible in the water today. Paul had his hair cut here because of a vow, and then set sail from the harbor, concluding his 18-month stay in Corinth (on his second journey; Acts 18:18). 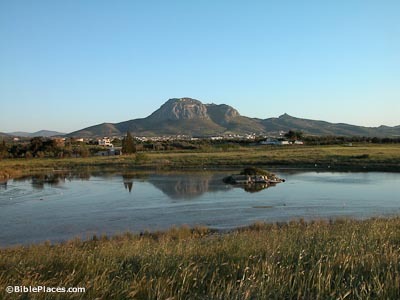 Isthmus of Corinth (LoveToKnow) Encyclopedia article providing general information and history about the isthmus. The Corinth Canal from Space (Navis) Satellite photo of the Isthmus of Corinth. 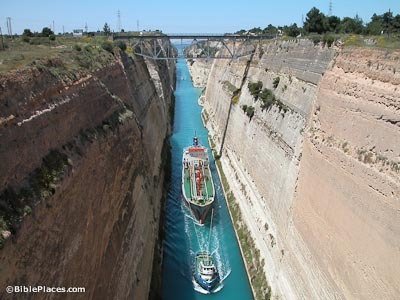 Corinth Canal – Diolkos (Sailing Issues) An informative article about the ancient Diolkos and the modern canal through the isthmus with a helpful map. Fortress of Acrocorinth (Hellenic Ministry of Culture) Provides general information on the fortification, conservation, and excavation of the Acrocorinth. Cenchrea (Christian Travel Study Programs) Summarizes the site’s history, excavation, and biblical significance.